Audi tuning shop Abt sent word of a new tweaker package for Audi's new A5. It's the AS5, and it includes such add-ons as a front skirt with a grid element that suggests the single-frame grill, side intake gills, rear spoiler and the rear skirt insert. The 3.0 TDI engine, Abt says, gets a significant "power treatment" that ups power from 240 hp to 272 hp — with an extra Abt turbocharger, power reaches 300. Underneath is an adjustable sports suspension, Abt brake system with a disc diameter of 380 millimeters and — in the rendering — the company's AR wheel, available for the A5 in the sizes from 18 to 20 inch. Gilding the lily, or painting the fence? You make the call. The new Audi A5 combines a sporty and an unobtrusive design to a powerful, elegant and individual appearance. "A uniquely beautiful car and thus a real challenge for us," says Hans-Jürgen Abt. The managing director of Abt Sportsline raved about the new Coupe from Ingolstadt, but he emphasizes that "our designers and engineers were able to improve the outstanding base model even more". The character of the noble sportscar still maintains but after getting a special treatment in the Allgaeu it appears more dynamical. The body kit, especially tailor-made for the Abt AS5, is a spectacular package: a front skirt with a grid element which emphasizes the singel-frame grill and the fog lights, the slightly curved, laterally mounted body parts and the sleek gill-shaped air-inlets, as well as the well-proportioned rear. With the unobtrusive but striking rear spoiler and the rear skirt inset in diffuser optics, the design of the Abt AS5 is gracefully rounded off. The 4-pipe rear muffler is perfectly fitting and additionally recontoures the rear view. Needless to say that the car sounds as a real Abt car should. Even when standing still, the Abt AS5 is a sensual car, which eagerly wants to be driven. And when it is allowed to go on the road, it shows how much sports spirit it has. First of all, the 3.0 TDI engine gets a significant "power treatment". The extremely powerful, self-igniting engine perfectly fits to the A5 and, in addition, offers moderate consumption values. By means of improved motor management, Abt turns the serial 240 hp (176 kW) into powerful 272 hp (200 kW). With an extra Abt turbo charger, the power even increases to 300 well feeded horses. Diesel and sportiness belong together since long. 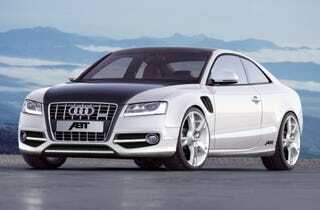 Certainly, Abt Sportsline will successively modify later developed A5 engines. To ensure a perfect handling of the noble power package, Abt also makes use of its adjustable sports suspension, besides the serial Quattro engine. All the more, the Abt AS5 will be brought to a standstill by means of the Abt brake system with a disc diameter of 380 millimeters. To perfectly round off the successful optics package, Abt Sportsline recommends the AR wheel, which is available for the A5 in the sizes from 18 to 20 inch, of course together with appropriate sport tyres. Wheels, body components and technical modifications build a whole unit: a wonderful Coupe at its best. Not more and not less.